April 9, 2001 Wilver Dornell “Willie” Stargell, hall of fame baseball player, died. 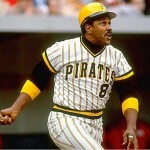 Stargell was born March 6, 1940 in Earlsboro, Oklahoma. Stargell was signed by the Pittsburg Pirates at the age of 18 and made his Major League debut in 1962. Over his 21 year career with the Pirates, Stargell was the 1979 National League Most Valuable Player, a 7-time All-Star, 2-time World Series champion, and in 1974 won the Roberto Clemente Award which is given to the player that best exemplifies the game of baseball, sportsmanship, community involvement and the individual’s contribution to his team. Stagell retired as a player in 1982, was inducted into the Baseball Hall of Fame in 1988, and in 2001 a larger than life statue of him was unveiled outside the Pirate’s PNC Park stadium.